The typical gridlock image is of being stuck in your automobile in a traffic system that has bogged down because it cannot handle the volume of traffic. You feel helpless because you have to use the car, but it's not getting you where you want to go. You are locked into a dysfunctional system. I use the term "gridlock" in your home to refer to a similar situation: you are locked into using the electrical power grid because it seems you have no choice, and if you look at the big picture, the system is dysfunctional. Electricity provided by the grid, at least here in the southwest, comes primarily from coal. Burning our finite supplies of fossil fuel to produce energy, with the byproduct of considerable pollution--especially the carbon dioxide that is increasingly blamed for global warming--would have to be considered dysfunctional. According to our local electric company, the use of electricity has been escalating, even though they frequently advocate conservation. So what can we do? Conservation is certainly part of the answer, and later in this article I will make some suggestions about this. Going to an alternative, renewable and clean energy source is another possibility, but not without its costs. 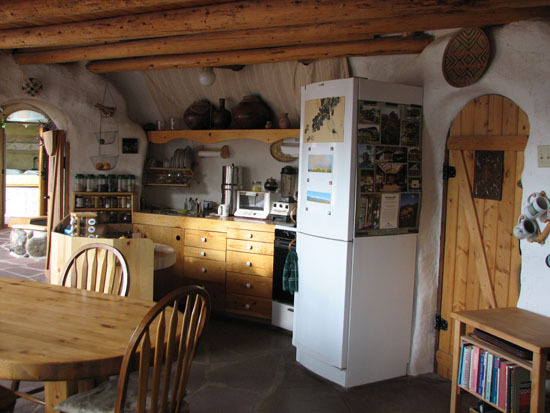 In our home, we have chosen to go with a hybrid system for our electricity. We are connected to the grid and some of the circuits are fed by that, but we also have a small solar electric system that feeds the rest of the house. We have eight 75 Watt panels that are fixed on the roof. They send 12 volt DC power to a dozen golf cart batteries in a vented compartment under some stairs. This stored power is then turned into regular household 110 volt AC power by an inverter that feeds the electricity through the breaker panel to certain circuits. Solar power basically runs our refrigerator/freezer, our clothes washing machine, most of the lights in the house, and miscellaneous small appliances (like the fax machine and photocopier). The kitchen circuits, the computers, and the video and television equipment are all served by the grid. If there isn't enough sunlight to keep the batteries charged sufficiently, the inverter will automatically recharge the batteries from the grid power. This system cost us approximately $8,000, with me doing the installation. It may never pay back its cost in actual dollars, but the real payback is in knowing that we are doing what we can to avoid GRIDLOCK. If you choose to use alternative energy for your electricity, photovoltaic (solar), is probably the best choice for many areas that get plenty of sun. Hydroelectric can work if you happen to have a stream running through your property. Wind power usually requires rather consistent wind to be worth installing. 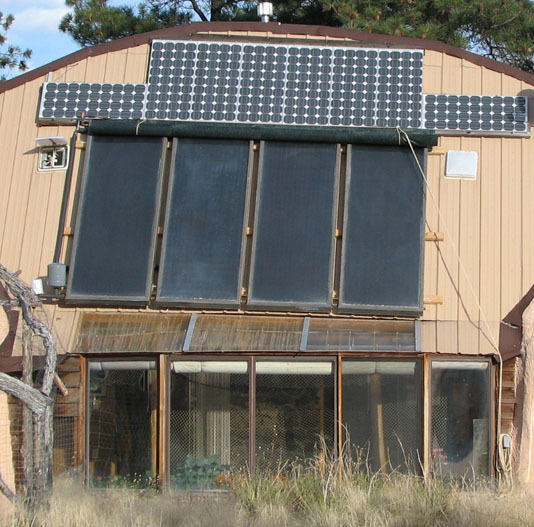 Solar electric systems are fairly complex, and require some knowledge and expertise to install. You might want the advice or help from someone with experience. Whether you use alternative energy or not, conservation should be the name of the game. (With stand-alone alternative systems, you are forced to conserve, or there won't be enough juice to run the show.) Some big consumers to avoid are everything that heats with electricity, like space heaters, electric stoves, water heaters, and clothes dryers. Air conditioners also use a lot of electricity; evaporative coolers are much more efficient, especially in arid localities. Compact fluorescent lights use about a third the energy of regular incandescent bulbs, and they last much longer. So even though they cost more initially, it pays in the end. There are certain major household appliances that make a big difference in how efficient your house is. The reason we are able to run our refrigerator/freezer and clothes washing machine with solar power is because we carefully chose models that are designed to use less energy. Our refrigerator/freezer is a Danish made Vestfrost or Conserve model with a total capacity of 12 cubic feet. It is rated at about 880 watt-hours per day, while domestic models typically run two to three times that. Sunfrost makes refrigerators that are even more efficient, but they are also more costly (starting at about $2000, where ours cost about $1,000). An added benefit with our refrigerator is that it is ergonomically correct, with the refrigerator portion above waist level, so you don't have to stoop to get stuff from it. Our clothes washer is a Sears Kenmore front loader. There is nothing really fancy about it; front-loading machines use less water, less electricity, less soap, and they are easier on the clothes. Our clothes dryer is heated with propane. Another little known fact is that many appliances consume electricity whether they are in use or not, just by being plugged in. Especially electronic equipment like televisions and VCR's operate this way. It's called a "phantom load", and it can silently eat up lots of electricity, 24 hours a day. Anything that is plugged in with those little cubes that convert AC to DC power will have a phantom load going. The best way to eliminate this unwanted drain of electricity is to plug these appliances into a power strip, and then turn the power strip off when you are not using the appliance. I've been living with solar electricity for about five years and I love it. I am still amazed by all the work that the sun can do, providing totally clean, renewable energy.